Located between Benidorm and Calpe on the Costa Blanca, lies the resort of Altea. Although you won't be impressed by the pebble beach, you will be impressed by the working port and fishing fleet. Watch the fish unloaded daily into the busy harbour. The marina is very quaint yet functional. Altea has been caught by tourism but only just. It has managed to retain its charm and beauty. There's also a huge international community here with foreigners who have made Altea their home. Altea can be reached via the busy N332 that runs south from Valencia. The town makes an ideal side-step from Alicante, Denia or Benidorm. There are 5km of beach in Altea, divided into different areas and the harbour is a popular tourist attraction. There are some wonderful spots to relax on the beaches. Much of the beach consists of soft pebbles. A visit to Altea must start at the highest part of the town. From the Plaza de Nuestra Senora del Consuelo with its unique church, topped with blue tiles, panoramic views can be had. Altea is a very attractive place to buy property with a wide range of bargain properties available. There is a thriving property market here. See about buying a property here. It's easy to understand why Altea became a Bohemian centre for musicians, artists and writers from all over Europe when they first discovered its delights back in the early 1960s. The town is now tailored to the demands of the modern day tourist but still retains that Bohemian air. You'll find a fascinating array of tiny shops offering exquisite local crafts, paintings and gifts. There are top class restaurants where you can enjoy the local seafood and rice dishes as well as some excellent international cuisine. The impressive new arts centre and concert hall - the Palau Altea Centre d'Arts - provides a wide range of entertainment and cultural activities for the benefit of residents and holidaymakers alike. The marina at Altea is very active and pretty. There are moorings for small pleasure boats and there's lots of free parking. There's a working fishing fleet in Altea and fresh fish are brought in daily. Altea can be a wonderful holiday destination if it's peace and quiet you want. You will find eveything you need in the busy town. 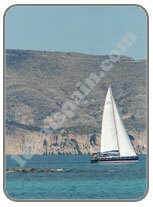 If you like sailing then Altea offers calm and clear waters. Altea has an excellent range of hotels of all styles and quality. You can see hotels in Altea here. There are sea front hotels, town hotels and rural hotels in Altea.